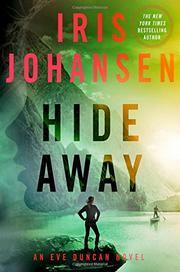 Forensic sculptor Eve Duncan’s back in the game in perennial bestseller Johansen’s latest bloody action thriller. Cara Delaney, an 11-year-old girl, is rescued by renowned forensic sculptor Eve Duncan and her lover, Joe Quinn, from the vicious killers employed by the Salazar drug cartel. Cartel killers have already murdered little Cara’s sister, Jenny, and Elena, the nursemaid who ran away with Cara to protect her from further harm. Now that Elena is dead, along with cartel assassin James Walsh, Eve and Joe have taken the little girl in until her life becomes less precarious. A great many complications ensue: for one thing, Cara is the daughter of Juan Castino, another Mexican drug kingpin, and they must be careful not to attract his attention or he will try to get Cara back. Eve’s afraid that Cara won’t survive in the middle of a drug cartel war, particularly since an especially vile young killer, Franco, is hunting for them. After Eve makes a startling discovery, she and Cara go on the run and end up in the Scottish Highlands with Eve’s adopted daughter, Jane, and some friends from past novels. Johansen fans will catch a veritable treasure trove of characters from her previous novels in this latest venture, with only the villains new to the strange world Eve inhabits. This book, like many of Johansen’s novels, features a child genius (Cara plays the violin so beautifully the characters do everything but weep when they hear her) and a smattering of individuals boasting mystical abilities (an animal psychic; a man who has weird powers over other people’s blood). There are a few action sequences, but mostly the characters talk a lot, many times in lengthy back story, making for an especially dull been-there-done-that reader experience. As in many of Johansen’s novels, readers are left dangling when it comes to Cara’s fate and must purchase the next one to find out what happens.